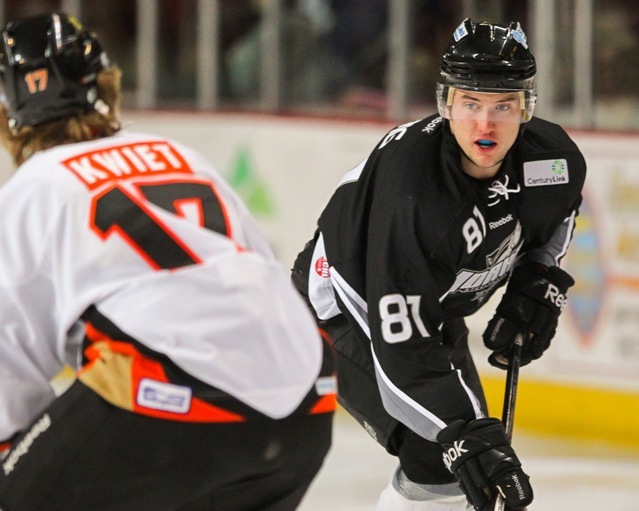 Forward Tristan King has been re-assigned within the ECHL from the Idaho Steelheads to the San Francisco Bulls. King is under contract to the Dallas Stars. The reassignment comes after King was arrested this weekend in Las Vegas for possession of a controlled substance. "It was an accumulation of things, and there was a recent discipline issue," said Will Hoenike, director of broadcasting and media relations for the Steelheads, referencing the weekend's arrest. "The team got together with Tristan, and both sides decided there needed to be a change." This marks the fourth different ECHL club for the talented winger in the last two seasons, including stops in Greenville and Ontario. Steelheads GM and head coach Brad Ralph spoke on the matter last night on the Idaho Steelheads hockey show on KTIK in Boise saying that it was a mutual decision and that the two parted on good terms. King was the Steelheads leading active scorer this season but was only called upon to play for the Texas Stars once in his career, an eleven game stint in 2010-11. Talent was overshadowed by off-ice issues for the past few seasons and ultimately led to his de facto departure from the organization. While King is still under contract to Dallas, these revelations make it unlikely that he will ever be called to play in Texas again. In return for the King assignment, the Bulls have sent Rylan Galiardi to join the Steelheads. I've always said that no matter how bad things seem, screwing up can only make them WORSE!!! Hope he figures things out before he self-destructs. yeah i don't blame Texas and Dallas and Idaho for wanting him gone. i'd probably do the same if i was a potential elite playoff team. strict no drug policy. Just want him to pull himself together before he ruins his career. Can't ride him to hard, he's not the first athlete to be arrested with drugs. Wish we knew more about the incident. Good luck king! I just want Tristin to know that this is not the end. It may be the wake up call you need to put your life in the right direction. You are a very talented person and I am glad to have got to know you. Good luck in your future and remember it's OK to ask for help.